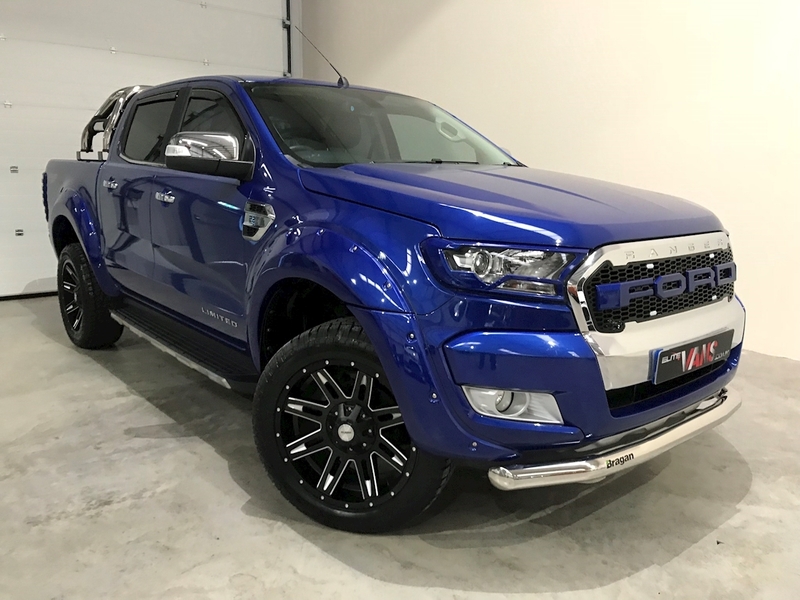 We have the pleasure in offering for sale this exceptional Ford Ranger Limited Elite Edition Crew Cab Pick Up Finished in Blue. It has 20” Black And Polished Alloy Wheels, Wide Arch Kit, Full Black Leather Seat Trim, Front And Rear Light Guards, Window Deflectors, Front Nudge Bar, Rear Chrome Roll Bar, Tow Bar, Upgraded Ford Front Grill with LED Lights, Fully Colour Coded, Electrically-Adjustable Drivers Seat, Auto Wipers with Rain Sensor, Bluetooth, Cruise Control, DAB Radio, Dual-Zone Electronic Automatic Temperature Control, Electrically-Operated Front Windows with One-Shot Drivers Window, Heated Drivers Seat, Heated Windscreen, Privacy Glass, Radio with MP3 Capability and AUX Audio Input, Rear Parking Distance Sensors, Rear View Camera, Satellite Navigation, Alarm, Touch Screen, Tyre Pressure Monitoring System, Voice Control for Phone/Connected Media, 5 Seats, 4WD, Folding Door Mirrors, Running Boards, And Airbags. If you would like to arrange a viewing on this vehicle please give our offices a call on 07815169520.